A meeting with Dolphins from Dorset in the Yetton Trophy, with two rinks at home and two away, ended in Arun ladies losing on all rinks. A Masons ladies’ trophy match against Adur ladies involved one rink at home, one away. Arun won the home contest but lost heavily away. The ladies are left only in the Vivienne Trophy, in which they had a great win against Adur, winning three out of four triples. 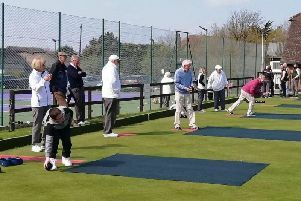 Sutton ladies visited Arun for a six-rink friendly, but Sutton won on all rinks and by 143-97. Arun ladies travelled to Eastbourne for a five rink friendly but lost 107-88. Scores: C Hillier, B Williams, J Adams, S Jones won 25-14; B Lawson, J Herdman, P Jones, L Hathaway won 21-16; M Potter, R Wiedenheoft, M Brand, W Adams lost 18-24; E Keywood, E Fitch, M Fair, B Spicer lost 11-23; J Whetstone, J Hazlegrove, S Singleton, B Jones lost 13-30. Arun men had mixed results. First they travelled to Egham and lost 130-91, losing on five rinks and drawing one. Scores: N Reynolds, B Smith, A Bateman, J Brazier (s) lost 13-26; L Etherington, J Ayling, K Ball, M Campbell (s) lost 14-20; R Pearson, B Smith, M Bird, M English (s) lost 17-18; N Waddock, D Wright, B Sanford, P White (s) lost 17-21; B Fitch, G Kendall, G Stevens, D Ford (s) lost 12-27; P Langridge, D Cripp, T Hayes, T Tack (s) drew 18-18. Things improved significantly when Arun hosted Grattons in the league. Only able to field five rinks instead of the required six, Grattons were penalised ten shots and one point for the vacant rink, while Arun won on four rinks and lost on two, giving them victory by 6-2 with a score of 128-97. Scores: K Ball, M Campbell, R Hobbs, L Corne (s) won 24-16; P Hamnett, T Cook, G Miller, B Butler (s) won 31-15; G Ball, N Waddock, R Corkett, M Hilton (s) lost 10-27; D Jackson, P Lichfield, M Bird, E Pidgeon (s) won 26-18; L Etherington, P Till, P Murphy, G Leaman (s) lost 17-21. Even better was to follow when Arun played a home friendly against Langney Sports. They won on all six rinks and by 184-76. Scores: P Lacey, J Jones, M Bird, A Avery (s) won 34-13; G King, G Kendall, D Ford, J Brazier (s) won 24-23; J Elliott, J Fox, M Johnson, P White (s) won 31-8; N Waddock, T Hayes, B Sanford, R Gardner (s) won 20-18; L Etherington, D Jones, R Hobbs, G Leaman (s) won 38-8; C Chester, B Mumford, K Ball, P Hannam (s) 38-6. In the south west division two, Southbourne Rovers lost narrowly in a home match against Nyetimber Bears. On the mat skipped by Alan Shelley, the result was very close until the last end when Southbourne just pipped the Bears. On the other mat, Nyetimber pulled steadily ahead with the result that overall Southbourne lost the match by four points to two. Scores: Margaret Odell, Colin Bulbeck, Jim Spivey, Alan Shelley (s) won 19-18; Eileen Keane, Joan Frost, Peter Garrard, Malcolm Keane (s) lost 20-13. In county division two, Southbourne Rangers visited Southwater Sharks. On both mats Southbourne were delighted to pull away steadily from the Sharks with relatively easy wins, to take all six points. Scores: Karen Alner, Pete Jasinski, Dave Walters, Andy Smith (s) won 19-9; Audrey Bull, Alex Horne, Dave Alner, Antony Bull (s) won 21-6. Infinity were invited to enter a team of four to play in a charity competition in Horndean in aid of the Children’s Air Ambulance. The team of Denise Kirby, Vanessa and Robin Armstrong and Steve Jeffery played teams from Hampshire and Surrey, winning all six of their group games. In the final, they played a team from Bisley in Surrey, finishing as winners. Richard Allen, the organiser, awarded the cup and individual glasses to the team. Vanessa Armstrong started playing with Infinity only about 2 months ago, having played outside several years ago. Infinity hosted Bognor Goodwoods in the league. In a very close game on both mats, Infinity won on mat one by two shots. On mat two the game swung from one team to the other finally finishing in a draw. Infinity took five points and Bognor one. The Eagles played Lavant “Blue” and took four of the six points with a very close match on one mat and a big win on the other mat. They won 46-28 overall. The close rink only lost on the last end – they were trailing by two shots but just missed out picking up the shots needed. Scores: S Weeks, S Tait, S Trussler, C Morgan lost 14-18; D Morgan, D Berry, C Dixon, T Berry won 32-10.